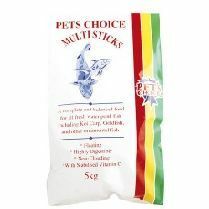 Pets Choice Multisticks are a complete and balanced food for all fresh water pond fish including Koi Carp, Goldfish and other ornamental fish. HIGHLY DIGESTIBLE - Most pond fish are omnivorous and eat a wide variety of food. Pets Choice Pond Food contains a specially formulated blend of animal and vegetable proteins that provides essential amino acids for healthy growth together with wheatgerm,a highly digestible source or protein. FLOATING - Encourages your fish to feed at the surface of the pond for your enjoyment and prevents build-up of lost food at the bottom of your pond.NON-CLOUDING - The food is specially formulated to be highly digestible to reduce water pollution and to prevent the break-up and disintegration of the food in the water, keeping your pond clear and well oxygenated. WITH STABILISED VITAMIN C - Vitamin C builds up the disease resistance and maximises the natural healing of abrasions and wounds in your fish. Pets Choice Pond Food uses a special stabilised form of the micronutrient that has been specifically formulated and tested for use in aquatic feeds.INGREDIENTS:Cereals, derivatives of vegetable origin, fish and fish derivatives, minerals, oils and fats, algae, EEC permittedcolour.TYPICAL ANALYSIS: Protein: 23 % Vitamin A: 3000 iu/kgOil: 3 % Vitamin D3: 1700 iu/kgFibre: 3 % Vitamin E: 150 mg/kgAsh: 9 %FEEDING GUIDE: Enough food should be sprinkled on the water surface so that it is consumed within 10-15 minutes. Overfeeding can cloud the water, underfeeding will result in the fish remaining at the surface seeking more.